Hellmuth Versus Ivey: "The Toughest Table at the Whole World Series"
Phil Hellmuth talked about a tough table and playing with Phil Ivey on Day 1c of the 2015 WSOP Main Event. A sea of unrecognizable faces makes up most of the Main Event, but two legends of the game got seated together on Day 1c in the Pavilion. Poker players often talk about running good and running bad. One aspect of running that's sometimes underrated is the quality of a table draw. A good table can mean the opportunity to amass tons of chips at will even without premium holdings, while a tough table can put the clamps on even skilled players. On Day 1c of the 2015 Main Event at the World Series of Poker, Table 256 in the Pavilion housed quite probably the toughest lineup in the room, and one of the toughest tables you're ever likely to find on Day 1 of the Main Event. Fourteen-time bracelet winner Phil Hellmuth occupied Seat 1. Across the felt sat one of the best of all time, the legendary Phil Ivey, a man with 10 gold bracelets of his own, in Seat 6. Oh, and Melanie Weisner occupied Seat 5, while Keith Lehr, winner of the Heads-Up Championship, was in Seat 8. It feels like it's probably the toughest table in the whole World Series. That meant Hellmuth had his work cut out for him in the quest for a second Main Event title in Las Vegas — he also took down the big one in 1989. "If there would've been feature tables and ESPN was here, I'd have been like, 'Something seems strange about this draw,'" Hellmuth said with a laugh. "It's weird, there's people that say they don't know people in whole sections. I've got Ivey, Lehr, and Weisner at my table. It feels like it's probably the toughest table in the whole World Series." Despite the tough draw, Hellmuth had worked his way up to nearly 60,000 on the final break of the night, when he spoke with PokerNews on his way to get a late meal. He acknowledged that in the chase for the all-time bracelet record, Ivey presents the greatest threat to the "Poker Brat." "Of course, Ivey's the one who is most likely to catch me," he said. "I recognize that. I think he's a great player and I have a lot of respect for him." Hellmuth then rattled off a few pots in which the two legends tangled. In one pot, Hellmuth said he had pocket tens and flopped top set on a flop. After he bet and Ivey called, Hellmuth turned quads. This time, Ivey led out and Hellmuth called. Then when a came on the river, Ivey led again, and Hellmuth popped it up with a raise. Ivey folded. In another, Hellmuth said, "I made the nut flush against him with king-queen of clubs and it came ace-five-deuce all clubs. I was only calling because the board was paired." Ivey got the better of Hellmuth a couple of times, though, as the two traded blows. In one pot, Hellmuth said he three-bet Ivey with and Ivey came back over the top, forcing a fold. 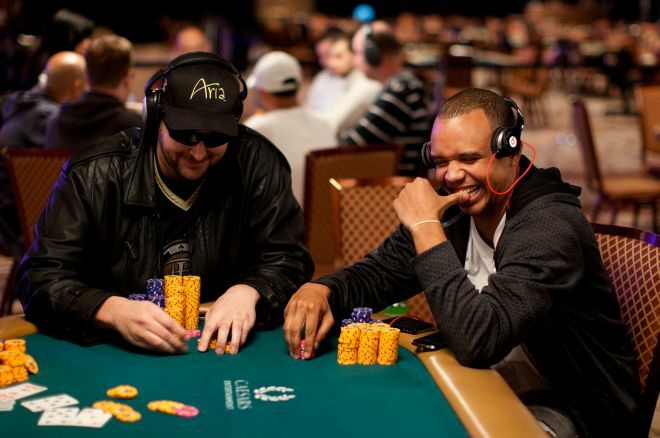 Later, Ivey doubled through Hellmuth when three players saw a flop and everyone checked. The arrived, and Ivey jammed from the big blind. Hellmuth thought awhile and called with the after everyone folded, and he needed help against the . A brick fell on the river and Ivey survived. "These things are always back and forth," Hellmuth said of their clashes. The table broke during the final level of the night, so the back-and-forth is over for the time being. Still, it's likely not the last battle between the two titans, as the bracelet race will continue in the years to come. Phil Ivey Arrives at the 2015 WSOP: "I Care About Bracelets, But Duty Calls"
Phil Ivey: "I Care About Bracelets, But Duty Calls"